Very colorful, nice balance and serene feel. Thanks 4 showing your work. Artist Reply: We all need a bit of serenity from time to time. Thank you! A very whimsical type abstract!!! 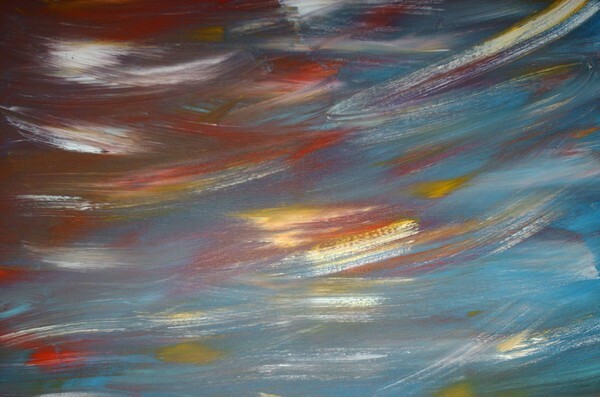 !...Love the style you used to get the abstract sky!!! Artist Reply: Thank you!! I love your comments and I appreciate you taking the time to view my work! Well-Done, and Dramatic! Reminds me of Autumn leaves blowing in windy weather. Artist Reply: Thank you for your gracious comments. I hope to show everyone more of my work soon. I'm new to the site and still learning the ins/outs.